Concealer is the arch enemy to my under eye! I've watched countless videos and and can't seem to mimic the flawless concealer look most vloggers achieve with ease. Mind you, I am older than most beauty bloggers and once the botox begins to wear off and the wrinkles appear, my concealer creases. A few days ago I had Dysport injected into my under eye area (under my eye, not the sides) to combat the little lines. I'm hopeful.. Will let ya know.. I'd like to use full-coverage concealer (sometimes I need it), but I gotta stick to light layers of sheer concealer and a little 'baking'. I'm a creature of habit and admittedly addicted to Bobbi Brown Cosmetics, but lately I've been exploring other brands. To my surprise, I'm switching concealer brands. But first.. Bobbi Brown Tinted Eye Brightener has been my go-to under eye pick-me-up for years. It's sheer, glides on nicely and brightens the under eye area. I use Light Bisque 2 - the pinkish shade works well to combat slightly dark circles. The Tinted Eye Brightener is meant for minimal under coverage and is just not enough for me anymore (FU*K AGING). When the Intensive Skin Serum Concealer and Corrector released, I was excited. New, lightweight under eye products by my favorite brand. I purchased the concealer in Ivory 2 and corrector in Light Bisque 2. The concealer is similar to the Tinted Eye Brightener - silky and weightless. The color is yellowish and it definitely brightens the under eye, but the coverage is light. I use the concealer first to combat the dark circles and then the Tinted Eye Brightener to lighten that area even more. The corrector in Light Bisque 2 doesn't jive with my skin tone AT ALL (despite the Tinted Eye Brightener being Light Bisque 2). I tried it a few times and am not willing to invest another $40 experimenting with different shades. I can't say if the product is good or not, cause I didn't give it a fair go. In come the 'NEWBIES'.. Laura Mercier Candleglow Concealer and Highlighter is AMAZING! It brightens the under eye area and highlights for a luminous under eye glow. It is sheer coverage, but the highlighting aspect makes a big difference. LOVE. 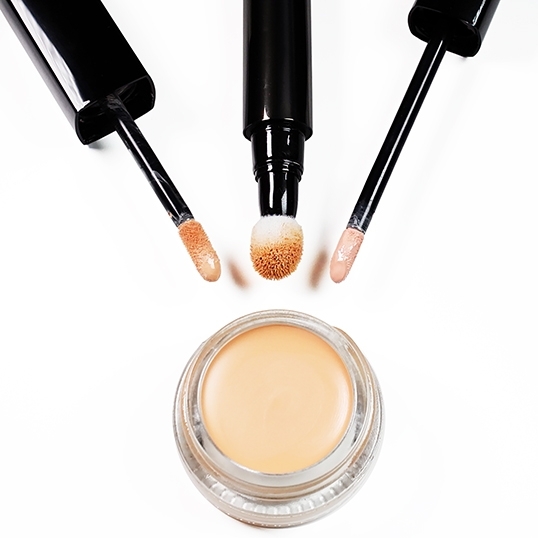 The round applicator is nice to the touch and allows for easy application. I use Fair to Light 1 - a shade lighter than my foundation. Another brand I've been obsessing over lately is Glossier. IntoTheGloss.com beauty blog comprised a cosmetic brand based on expert opinions from the 'coolest girls on the planet'. I'm a fan of the blog and am falling in love with the cosmetic brand. One of the MANY products I purchased is the Stretch Concealer. It comes in a glass pot - preferable packaging (so you get get every last bit). The formula is lightweight, silky and when applied with your ring finger, goes on nicely. It is sheer coverage, but layers well. The nourishing oils are apparent in the texture and results. I can see myself applying this concealer to other areas on my face for a little brightening and sheer coverage on dry spots.